Soweto Gospel Choir was founded in November 2002 and within a few months reached No. 1 in the Billboard charts for World Music. They received numerous awards around the world, including an American Gospel Music Award, following the debut of their first album, “Voices of Heaven”. In the United States, they have appeared on a number of talk shows including “Late Night with Conan O’Brien”, the “Today Show” and “The Tonight Show with Jay Leno”. 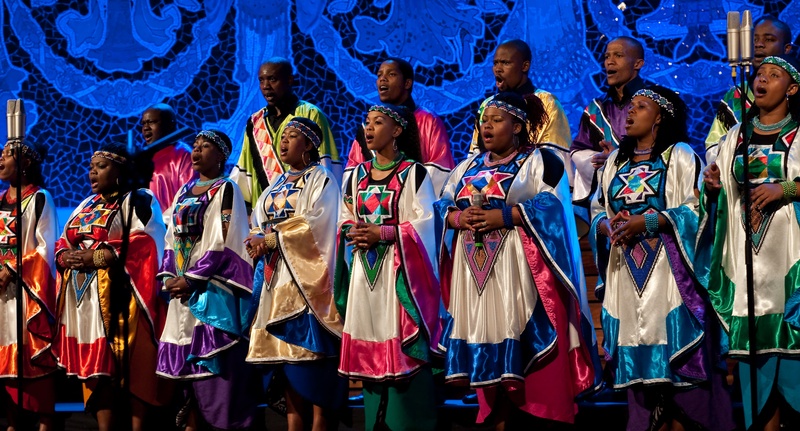 In 2007, Soweto Gospel Choir won their first Grammy for their album, “Blessed”. Since then they have been nominated 3 more times, winning a second Grammy in 2008. They have collaborated and performed with many world artists, including Josh Groban, Celine Dion, South African sensation Zahara, and classical violinist Andre Rieu. They collaborated with Peter Gabriel on the Oscar-nominated song, “Down to Earth” from the movie Wall-E and became the first South African artists to perform at the 2009 Academy Awards. Soweto Gospel Choir collaborated with U2 in 2010 as the featured South African artist on U2’s songs “Streets Have No Name”, “Magnificent” and “Boots” for ESPN’s promotional campaign for the 2010 World Cup. This led to a Sports Emmy Award for all three songs in 2011. We are excited and grateful that Soweto Gospel Choir is supporting POSITIVELY BEAUTIFUL. In addition to being a world-renowned choir, they are actively involved in HIV and AIDS work. They have an AIDS orphans foundation, Nkosi’s Haven Vukani in South Africa. We are honored to be able to include their incredible music in our film. Visit their website for more details about the group. Zimbabwe-born Berita moved to South Africa to study at Walter Sisulu University in the Eastern Cape Province. Her album, “The Conquering Spirit” has been exceptionally well received. Berita won the Best African Pop Album of the year a the Metro FM awards, one of South Africa’s major music awards event. Her song Thandolwethu (Our Love) is currently Berita’s number one single in South Africa. Berita writes her own music and sings in Xhosa, Ndebele, Shona, and English.